Star Dunes B] My favorite. And yes, there is wind down there to sculpt them. This month should be fun, I’ve set a goal of 21 Shingworks comics updates to make up for last months’ impaction (you can read about it in the previous post). We’ll see how that goes! If you are a Patron of any level, you already have access to the sketch versions of the next 4 updates, but after that we’ll be back into shiny new territory. This chapter is finishing in the 40’s pagewise so we’re getting close. On the off chance that you missed it, a giant tutorial also recently went up on Patreon. This month’s topic was about writing for webcomics. Had a lot to say on that particular subject, haha… next month’s topic is ready for public voting now at the same link. More bonus content will be up soon. 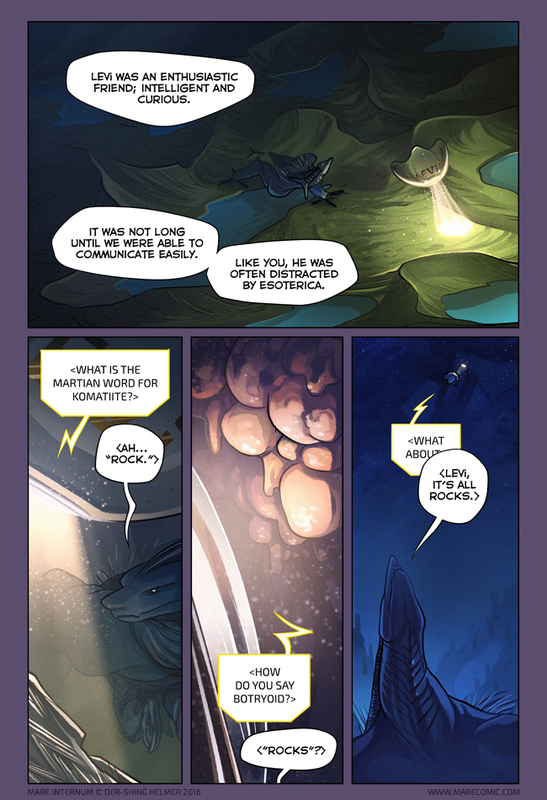 The other thing I’m working on is a Kickstarter for my other comic, The Meek. That will be launching in August for the first ever printing of the first three chapters in book form. Things are starting to get serious with that project. As a matter of fact, I’m working with several members of the Beyond team running the above KS (many of who work professionally in comic book production) to ensure that the quality of this book is top of the line… If you’re not reading it already now is as good a time as any to start XD. This is me when it comes to geology. Regarding minerals – we had to make a modest collection of “n” of them at some point in school as an assignment. After salt crystal, marble chip and the like I ran out of ideas at exactly “n-1”. So I took one of the plastic bags holding the samples, sealed it with some air inside, and slapped a label under it: “METHANE”. Because yup, underground hydrocarbons are minerals too, and are you seriously gonna test that sample…? Anyhoo – the teacher was amused, I passed. Oh my god, that was perfect. I just started Breaking Bad last weekend and I watched that episode yesterday! A much-appreciated reference. At the Lake Victoria in East Africa there are (or were) more kinds of cichlids than everywhere else, hundreds, if I remember correctly. To the natives, they were all “fish”. To be surrounded by something doesn’t mean you know much about it! The answer is Rock. Thanks, I’ll try it on math exam. Things Kallakore is not: geological engineer. Ignorant, innocent Kallakore is so cute. Like a baby. lol, so harsh. I doubt the average Earthling would be able to reciprocate with the proper translation. A botryoid is a rock that has contracted botulism. Incidentally, I plan to name my first child Botulus. As a geologist, I too have been distracted by esoterica throughout this comic’s run. Furthermore, I can assure all present that Kallakore’s classification is 100% scientifically valid and correct. Look up the conlang called Toki Pona, it’s structured the same way and is a lot of fun to learn! Both LEVi and Kallakore are correct in their classifications. It’s all about intent and perspective. I’m assuming Levi learned and is speaking “martian” inside the ‘s? Maybe they should be outside the brackets? Probably, but since everybody understands what is going on anyway, it would be kinda pointless to bother with it, I guess. It’s a small detail, I think most people will naturally assume these words were non-martian. If you want to emphasize that, a simple fix could be to add double quotes, like you already did with “rock”. “LEVi, it’s all rocks.” Why is that SO cute. Martians have 300 words for rocks. They’re all pronounced “rock”.